Sometime in August of 1999, I received a hand written letter from Mergata Yitbarek Gessesse Mera with an enclosed twelve pages of typographic design by Ato Yigezu Bisrat. They were copied, I think, from Ato Yigezu Bisrat's book, which was published around 1962 in Ethiopia. I never met Mergata Yitbarek Gessesse Mera in person, but because of my other work we had communicated over the phone. If it wasn't for him, I wouldn't have been exposed to Ato Yigezu's work as it did earlier. Now, someone has put a page dedicated to Ato Yigezu Bisrat and his work and what so exciting about that page is five of his books are scanned and posted and there are other interesting materials also. I don't remember if I finished reading the letter before I started pouring myself on what was in front of me. I entered the world of Ato Yigezu's typographic scene with an immense excitement. It was unlike anything I had seen in the past. It broke the limiting shell in which I was enclosed in. In all, there were thirty designs; most of them are based on various Gothic style while a few of them are pure originals. I don't know why, but Gothic designs seem to be popular among fellow country men and if that is an indication, you see a lot of it in Ato Yigezu's work. My immediate reaction to these magnificent typographic design, besides my emotional jolt by it, was to focus on a few and study them further even though I don't consider myself as a typographer. No matter what, it was an inspiration that I didn't want slip out of my hand. My first choice was the family of "Hareg Lebess" designs, but I sidestepped and moved to what Ato Yigezu Bisrat calls "Gothic Goffer". There are 26 letters from Ethiopic first order and ten digits. That is all. It should be noted that in modern Ethiopic there are more than 345 characters including digits and punctuation marks. For me working on this design means, creating a font supporting the entire Ethiopic character set and no less. 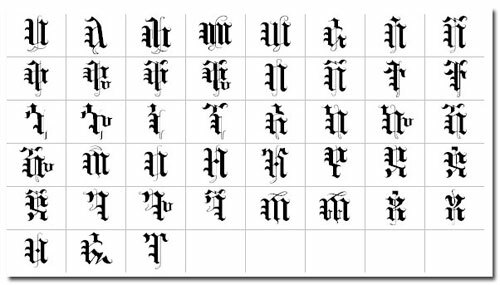 Looking at the designs and appreciate them is one thing, but designing the remaining over 300 characters consistently with the same structure and form of the original design and creating the font was a formidable challenge. I worked on it through the years whenever chances afforded me and now I think it has reached a level the font is practical and useful. Remaining design concerns and compatibility to Unicode 4.1 is something I will look in the future. Originally, the design was called "Gothic Goffer" by Ato Yigezu Bisrat and keeping this would have been appropriate as a font name, but in dedication to him for his contribution on typography; in particular, to the original design of this typeface, naming the font "Yigezu Bisrat Goffer" does allow to capture the portion of the original name as well as the dedication to him. The font format is True Type and supports the 345 Ethiopic characters included in Unicode 3.0; this is in addition to Basic Latin and Latin-1 supplement. The figures below show the first order Ethiopic alphabet, punctuation marks, and digits. Some characters design or shape are different from their traditional look, for they appear beautiful and blend well with others. At first, some may have difficulty reading or identifying these characters; as a result, they may feel uneasy about them. What makes Ato Yigezu's design unique is his willingness to cross boundary and explore the unknown. That is bold; that is beauty. Engraving a shape in our mind to the point we allow it to prevent us from being creative or innovative is instant death. The font is distributed under the GPL license; that means, it is free. You may download it here. by Mergata Yitbarek Gessesse Mera. A page entirely dedicated to Ato Yigezu Bisrat and his work.